Two weeks ago, St Augustine began their Christmas festivities with a night of turning on the Christmas lights. St George Street is bustling with folks on holiday and locals shopping in all the neat shops. But one of the best places to hang out is La Taberna del Gallo - lit at night with candles and lanterns and serving up a great sangria along with selected beer on tap, wine and cider, the place has the greatest ambiance. And if you're lucky, you'll pick a night the Bilge Rats are singing. 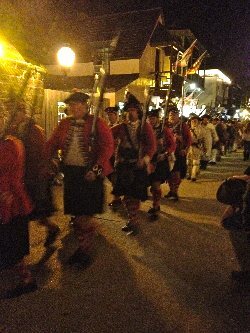 Last night I dressed out and attended a lovely dinner put on by the folks from the Spanish bakery, then watched the Grand Illumination - British Night Watch parade which commemorates the years 1763 to 1783 when St Augustine was under the rule of the British. Playing tavern wench at La Taberna is always fun, but last night was especially exciting with standing room only most of the night capped off with the singing of the Bilge Rats. One of these nights, if you've never been to La Taberna, come on by and experience tavern life as you would have had you lived in 1740.